Celebrity chef Hasset Go passed away on Saturday after battling liver cancer for over a year. He was 29. Chef Hasset's brother, Rowden, also died from the disease last year at the same age. After Rowden was diagnosed with Stage IV live cancer in May 2014, Hasset and the rest of their family members reportedly underwent diagnostic tests to find out whether they also have the ailment. It was discovered that Hasset had it as well. "Happy Anniversary to us liver! Hahahhaha.. Praise God! Naka isang taon narin pala, after my major liver operation or surgery. Nalagpasan ko rin ang naging prognosis sa akin during that time. Truly our God is an Awesome GOD! Ngayon, kahit tuloy parin ang laban ko.. Alam ko isang araw matatapos din ang lahat ng 'to. I confess that I AM HEALED by the BLOOD OF JESUS CHRIST! I AM DELIVERED! I AM SET FREE! I AM ETERNALLY RELEASED! Thank you all for your support, love and continued prayers!" 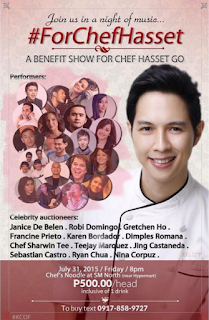 On July 31, 2015, a number of celebrities and personalities participated in a benefit show and auction which raised funds to aid in Hasset's cancer treatment.